The centennial of the naming of William Henry O'Connell to the College of Cardinals on Nov. 11, 1911 provides The Pilot a chance to recall and celebrate that historic event. This is the last of the brief biographies about Boston's cardinals, native sons, or seminary alumni who received the "Red Hat" in the course of their lives. John Joseph Wright was born on July 18, 1909 in the Dorchester section of Boston, the first of six children of John Joseph and Harriet Louis (Cokely) Wright. He attended Boston Latin School and was graduated from Boston College in 1931. Having discerned a vocation to the priesthood, he was accepted as a candidate by the Archdiocese of Boston. Entering St. John Seminary in 1931, the following year he began studies in Rome at the Pontifical North American College and the Pontifical Gregorian University. 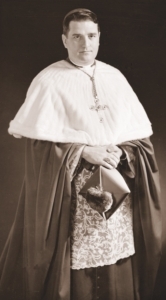 The vicar general of Rome, Francesco Cardinal Marchetti Selvaggiani, ordained him a priest in the chapel of the North American College on Dec. 8, 1935. Father Wright remained in Rome until 1939, pursuing graduate studies. He received his Licentiate in Sacred Theology (S.T.L.) and his Doctorate in Sacred Theology (S.T.D.) from the Pontifical Gregorian University in 1936 and 1939 respectively. Returning to Boston, he was assigned to the faculty of St. John Seminary, teaching theology and philosophy from 1939 to 1943. He also served as the secretary of Cardinal O'Connell until the latter's death on April 22, 1944. Named secretary to Archbishop Richard J. Cushing in 1944, he received papal honors on Dec. 17, 1944 with his nomination as a papal chamberlain with the title of Very Reverend Monsignor. Archbishop Cushing requested the appointment of an auxiliary bishop from Pope Pius XII who granted his petition and named Msgr. John J. Wright to be Titular Bishop of Aegeae and Auxiliary Bishop of Boston on May 10, 1947. Archbishop Cushing had the pleasure of conferring episcopal ordination on his new auxiliary bishop on June 30, 1947 in the Cathedral of the Holy Cross, being assisted by Bishop Ralph Leo Hayes of Davenport and Fall River Coadjutor Bishop James Louis Connolly as the principal co-ordaining bishops. Bishop Wright chose Resonare Christum (To echo Christ). Bishop Wright assisted Archbishop Cushing with confirmations and other episcopal duties, but he was not to remain auxiliary bishop for a long time. On Jan. 14, 1950, Pope Pius XII divided the Diocese of Springfield, separating Worcester County, and established the Diocese of Worcester. On Jan. 28, 1950, the Holy Father named Auxiliary Bishop Wright of Boston as the first Bishop of Worcester. On March 7, 1950, Bishop Wright was installed as Worcester's first bishop by Archbishop Richard J. Cushing in the newly designated Cathedral of St. Paul. Bishop Wright set about establishing the offices needed for the orderly functioning of the new diocese and appointed the first officials for the chancery office. The new diocese had 100 parishes, 54 elementary schools, and 14 diocesan high schools. served by almost 250 diocesan priests and more than 150 religious priests, more than 1,100 women religious and 34 religious brothers. More than 20,000 students were being educated in the primary and secondary schools and the Catholic population was in excess of 250,000. When Bishop Wright departed the diocese in 1959, he left it with 25 more parishes than when it was established with increases in the number of priests and religious and a Catholic population which had grown to more than 310,000. In December 1958, the Diocese of Pittsburgh fell vacant when its ordinary, Bishop John F. Dearden, was named Archbishop of Detroit. Barely a month later, on Jan. 23, 1959, Blessed Pope John XXIII gave Pittsburgh a new bishop in the person of Bishop John Joseph Wright. He was moving from a see whose diocesan history spanned nine years to one of the venerable dioceses in the United States with a history of 116 years. The two dioceses had one thing in common: the cathedral church of both was dedicated to St. Paul. On March 18, 1959, Bishop Wright was installed as the eighth Bishop of Pittsburgh in St. Paul Cathedral. Two days after he appointed Bishop Wright to the See of Pittsburgh, Blessed Pope John XXIII announced the convening of the Second Vatican Council. Bishop Wright was an active participant in the Council, attending all four sessions. From September to October 1967, he was a participant in the First Ordinary Assembly of the Synod of Bishops at the Vatican. Between 1960 and 1971, he conferred episcopal ordination on six priests, two of them for Papua New Guinea, and between 1951 and 1968 he was principal co-ordaining bishop for four bishops, one of them for South Korea and another an Armenian Catholic bishop. On April 23, 1969, Pope Paul VI appointed Bishop Wright to be Prefect of the Sacred Congregation for the Clergy. On April 28, 1969, he was created a cardinal and on April 30, 1969 he was given the presbyteral title of Gesu Divin Maestro alla Pineta Sacchetti and received the red biretta. His resignation as Bishop of Pittsburgh was accepted by Pope Paul VI on June 1, 1969. Cardinal Wright was appointed a member of the Sacred Congregations for Bishops, for the Evangelization of Peoples, and for Catholic Education as well as the Council for the Public Affairs of the Church. He was also named a member of the Pontifical Commissions for the Revision of the Code of Canon Law and for the State of Vatican City as well as the Cardinalatial Commission for the Sanctuaries of Pompeii and of Loreto. As a cardinal, he was a member of three ordinary and one extraordinary assemblies of the Synod of Bishop between 1969 and 1977. In 1972, he visited Auschwitz along with three other cardinals to honor the then recently beatified Maximilian Kolbe. He was unable to participate in the August 1978 conclave which elected Pope John Paul I due to illness. He did participate in the October 1978 conclave which elected Blessed Pope John Paul II. Cardinal Wright was well-known for his defense of the right to life and other traditional Catholic teachings as well as his support of civil rights and his opposition to the Vietnam War. What many may not know is that he had a lively interest in St. Joan of Arc and had an immense collection of materials about the saintly Maid of Orleans which he donated to the Boston Public Library and which is housed in the Cheverus Room of the Copley Square main branch. In 1976, he donated his collection of 6,000 items to the Boston Public Library. After surgery for a neuromuscular condition in 1978, he was unable to walk and required the use of a wheelchair. Cardinal Wright died of polymyositis on Aug. 10, 1979 in the Youville Hospital and Rehabilitation Center in Cambridge. He was interred in his family's plot in Holyhood Cemetery in Brookline.